Tinker, tinker little star! How I wonder what you are! Apparently on weekends, there are queues to line up at this super cute, modern cafe that only recently opened its doors on High Street, Northcote! Is it just another new kid on the block? Well, there is no surprise that there are queues over the weekend! Lucky for me, I missed the lunch time rush, so was offered a table and decided to go for the pea smash! 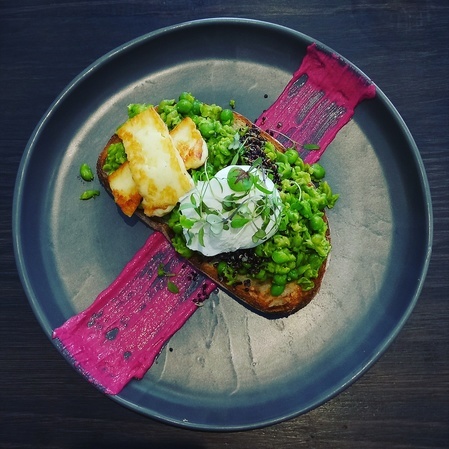 The plated dish looked like a work of art - the beetroot smeared across the plate, the sourdough toast was warm and crunchy, topped with smashed peas, with beetroot, borani labne, feta, black quinoa, poached egg and my favourite fried cheese, halloumi. Yum! The food is fresh and wholesome, staff are friendly, plus there's cool tunes and a great vibe. I will most certainly be back to try out their other dishes on the menu!